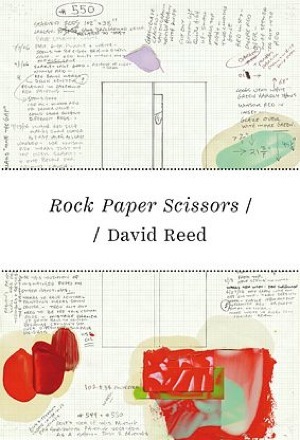 »Rock Paper Scissors« by David Reed is the third volume in the »Kienbaum Artists’ Books« series, which, alongside giving an insight into the collection, sets out to present an artistic position in a high quality form once a year. 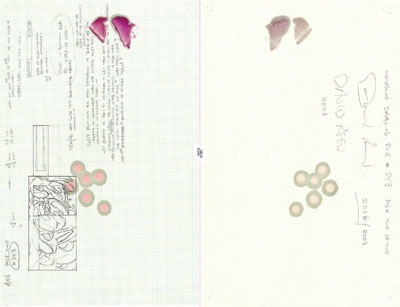 The edition on David Reed contains 24 »Working Drawings« recto and verso, that document the process involved in the New York artist’s large-format paintings. 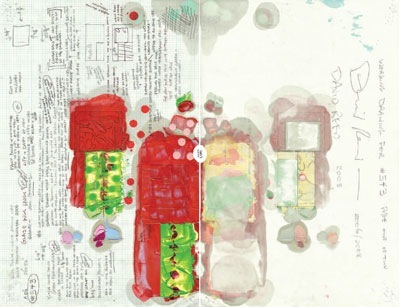 They arise rather like drawings in diary format and accompany each individual painting; they contain colour charts as well as trains of thought and decisions often recorded over a number of years. 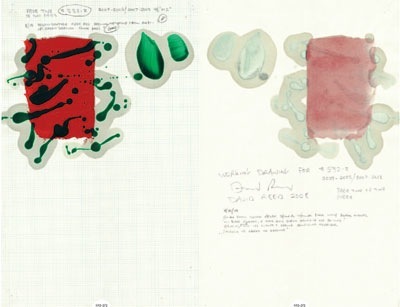 The idea for these unusual works can be traced back to a conversation with Dorothy and Herbert Vogel at the beginning of the 1990s, in which they asked David Reed specifically for drawings and he showed them his notes, diagrams and plans in his studio. The conversation between Reed and the Vogels which accompanies the book returns to this situation and deals with the specific considerations relating to these »Working Drawings«. Thus we glean information in the artist’s work itself, how for example he arrives at his special »all-over« style—that sea of repeated loops and swirls, the waves of brush strokes and spots seemingly hurled at the surface of the painting with gestural flourish. 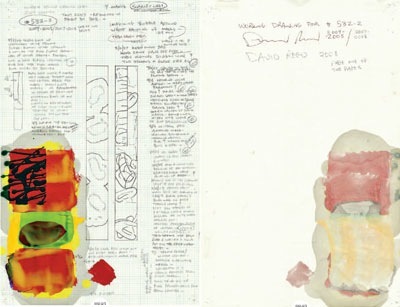 These very unusual sketches illustrate beautifully how David Reed arrived at his engagement with colour and abstraction, how he came to follow Baroque painting, abstract expressionism or minimal art consciously with a view to utilizing the movement of the observer because he positively »vibrates« his paintings.